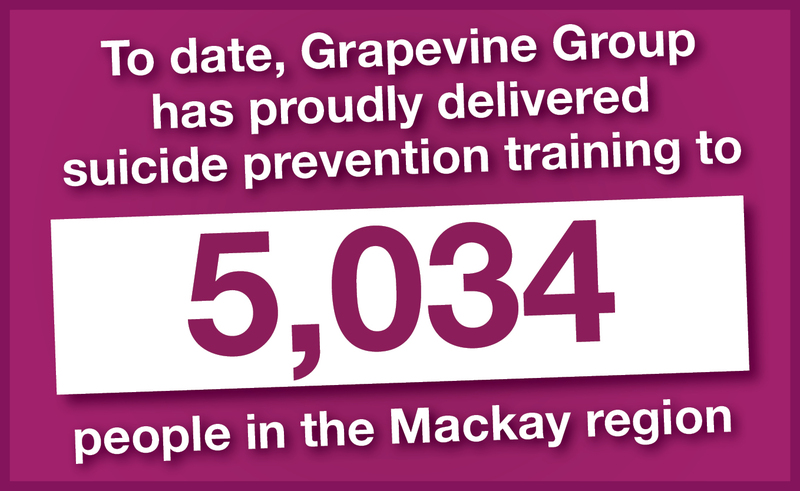 Grapevine Group Assoc Inc is a locally founded grassroots volunteer group who raise funds and awareness for suicide prevention in the Mackay region. We also work to remove the stigma for mental illness. Grapevine Group relies entirely on community support and has operated since 2004. We are a member and support; Suicide Prevention Australia (SPA), Mackay Regional Mental Health Network (MRMHN) and Mackay Regional Suicide Prevention Network (MRSPN). Due to needed restrictions in the media too many people will hear of a tragedy along the ‘gossip grapevine’ and not of the resources available to them. Grapevine Group intends to change that! Grapevine promotes the resources that are available by drawing attention to the issue in a very positive light. Grapevine Group are a registered charity with Tax Deductible Gift Receipt Status (DGR). Donations of $2 or more are tax deductible. We are a volunteer organisation that has operated for the past 15 years, and are dedicated to supporting local suicide prevention projects having funded Mackay Region locals through LivingWorks suicide awareness and intervention training. We have trained thousands in the community through safeTALK and trained police officers, high school teachers, front line youth workers and key members of the local workforce and volunteer and sporting groups through 2 day LivingWorks ASIST suicide intervention training. Local trainers also present free safeTALK suicide alertness training to anyone in the Mackay region. This training is available to both individuals and groups. We urge local businesses, and sports and community organisations to have their staff and volunteers trained to identify someone at risk, talk to them correctly and then link them with resources. 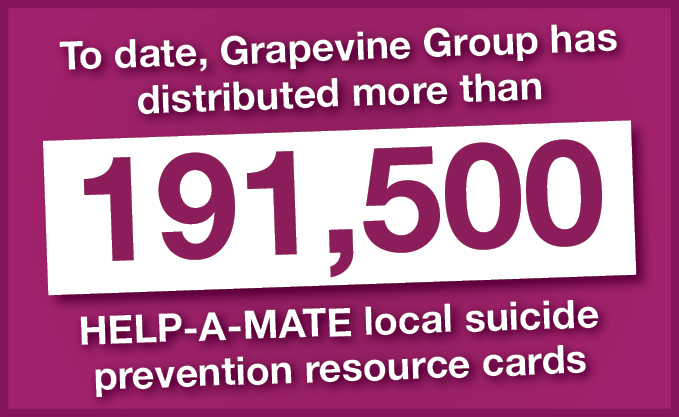 In 2005 Grapevine compiled a comprehensive online list of local suicide-prevention resources and maintain it with the assistance of Queensland Health. Since 2009 we have printed and distributed Help-a-mate suicide prevention resource list cards at local events, to local businesses, clubs and organizations. A significant achievement of this effort is that these cards are now being used by the region’s emergency services such as GPs, ambulance, police and hospital emergency departments. If you, a friend, family member or someone you know seems to be really struggling. Click Here to find help If You Need Help...YOU ARE NOT ALONE! Keep track of us on all your favorite social networks.